I'm hostess today and I've chosen a "thank you" theme. Thanksgiving here in the U.S. is just two weeks away! I could have sworn it was just July and now it's November. I know the Canadian Thanksgiving was last month and there are a lot of holidays coming up in December and the holidays, whatever you celebrate, are always a good time to be more thankful than usual. You could say I have a lot to be thankful for lately. Yesterday I thought it was Thursday more than once and I was in a total panic! I didn't have my blog posts done. So I am thankful it wasn't Thursday yesterday. I've lost track of time lately and if I wasn't constantly behind I wouldn't know where I was. LOL So guess I'm thankful to at least be somewhere. I'm also thankful that no matter that it looks like every room in the house has exploded over the past few weeks while we are redecorating/mini-renovating, we have a home. I'm thankful that even though the materials we ordered ---interior doors, doorknobs, door jams, moulding, crown moulding were a week late, we now have them. It would have been nice had the jams and baseboards been primed like I thought they would (guess what I'm doing after the holidays), but I am thankful for the local building supply store that built them. Of course, then the hubs fried our dining room dimmer switch trying to put up a new light. So I am thankful he didn't fry himself in the process as well. And, I'm thankful at least re-painting of Phase One is done. I decided to do some stenciling. 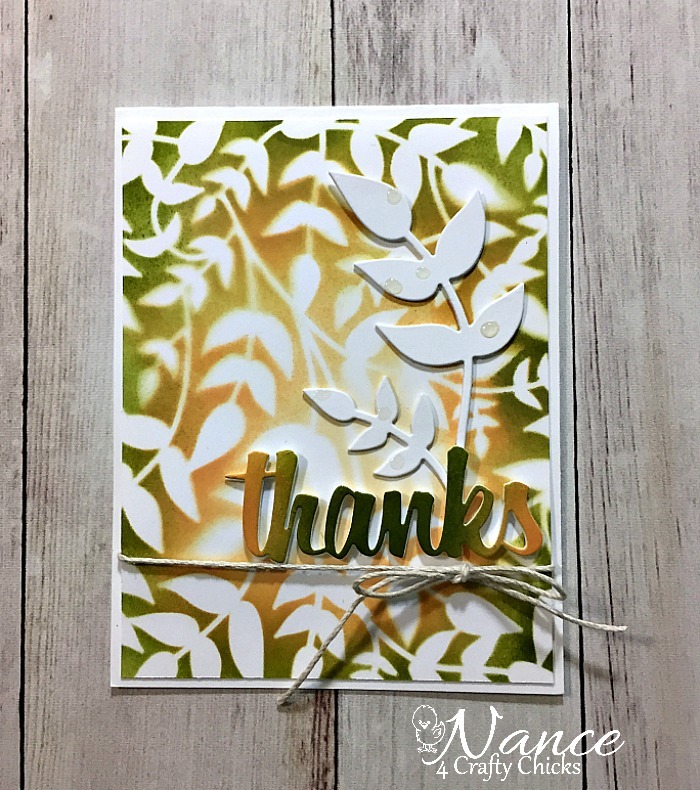 I used the Perfect Vines stencil and dies by Catherine Pooler and a "thanks" die from Lil Inker Designs. I blended Peeled Paint and Dried Marigold distress inks over the stencil and also used them for the sentiment die. I added some Glossy Accents to the leaves and finished the card off with some kraft twine. Make sure to visit the Hen House and see the projects by my teammates' Leanne, Tamie & Lori and our November Guest Designer, Lisa. Then get crafty and share your own "thanks" project with us in the Inlinkz! I found inspiration for my card with this week's Muse Challenge in the colors, the leaf background and the layout. I did kind of a reverse in that I stenciled my background and made my die leaves white. Wow, you sure have been busy! I can't wait to see the fruits of all your labors! I love this stencil and matching die! Your colors are wonderful for fall and I love how they fade a bit in the center adding lots of depth! I'm thankful that Dave didn't get fried. How scary. Sounds like Bruce not flipping off the circuit before he takes the outlet apart. They do like to live dangerously! And I'm thankful for you too, my friend. See you soon. So beautiful! Love the blended background - those colours are rich and warm, perfect for autumn and thanks! Thank YOU for joining us at Muse this week!